The Libyan Desert’s sand seas aren’t called “seas” for nothing. For kilometer after kilometer, your horizon is bounded by nothing but rolling waves of sand—not a stick of vegetation breaks the surface, and your tracks are erased by the wind as surely as water reclaims the wake of a boat. And—just as with a real sea—you can sink in it if you’re not careful. That was on our minds as we faced a 30-kilometer off-tracks “shortcut” to regain the highway to Cairo on a photo-matching expedition that retraced a century-old Carnegie Institution survey route. Our three Toyota Land Cruiser FZJ78 Troopies—heavy vehicles to begin with—were further weighed down with team members, support staff, and equipment, and shod with narrow 235/85-16 BFG All-Terrains—not most people’s idea of a sand tire. Negotiating the dunes required full-throttle blasts up the windward faces, 1HZ diesels roaring, followed by heart-stopping glissades down the 45-degree leeward faces. Flat sections in between were littered with hidden pockets of Habat—sand so soft virtually no flotation is enough to stay on top of it. And yet, with those skinny BFGs aired down to one bar (14.7 psi), we reached the highway through that wilderness of sand with only a couple minor boggings. 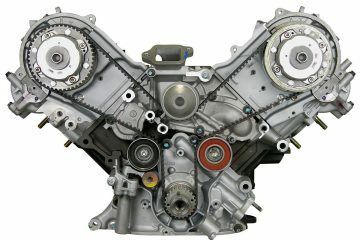 I’m constantly disappointing people who ask me about the best way to improve the performance of their four-wheel-drive vehicles when I tell them, “Buy a high-quality air compressor and a set of deflators.” I’m sure they’re secretly hoping I’ll facilitate some more glamorous modification: diff locks, external-bypass shocks, titanium valve covers—something that would warrant a stylish brand decal in a window. 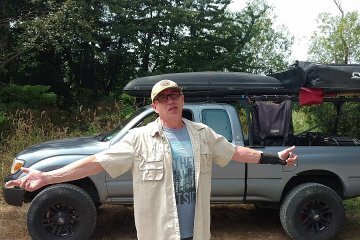 But the simple truth is nothing will enhance the capability of your vehicle more than modifying tire pressure to suit conditions, whether it’s removing just a few pounds to gain better traction on rocks, or dropping all the way to sand-sea levels for maximum flotation. Performance is not all you gain by varying air pressure. Dropping 10 psi from street pressure takes much of the sting out of washboard roads and those trails littered with “baby head” rocks. And that’s easier on the vehicle as well as your cervical vertebrae. Finally, by enhancing traction you reduce wheel-spin, and that reduces erosion on trails. It’s a win-win-win situation. However, there’s a problem: We humans are lazy and impatient, especially when there’s a trail to be explored on limited time off work, and friends tapping their feet while we fiddle with our tires. So if airing down—and up—can’t be done quickly, we’re very likely to simply skip it. The solution is to take the professional approach. Skip the $29.95 compressor with the built-in flashlight—one session waiting 10 minutes as the thing buzzes in circles on the ground like an enraged Chihuahua while taking a tire from 27 psi to, say, 29, and you’ll never air down again. The same goes for reducing pressure by poking at the valve core with the awl on your Swiss Army knife. Use the right equipment for the job, and not only will the process be quick, but your superior performance on the trail will quickly convince your friends that you’re on to something worth emulating. Since deflating your tires is the first thing you’ll be doing, let’s look at options there. For years, I aired down by simply using a valve core tool to completely remove the valve core on each tire. This produced a satisfyingly brisk rush of air (way faster than the Swiss Army knife approach), and a tire pressure gauge would still work to monitor the procedure. However, the blast when removing or reinserting the core always wanted to rip the tiny thing out of my fingers and fling it ten feet behind me, never to be seen again, and leaving me with a tire aired down a trifle too far. There are better ways. The ARB EZ deflator also removes the valve core to facilitate fast airing down, but captures it inside the mechanism so there’s no chance of loss. A gauge monitors pressure so you can reach the desired level precisely. While it only works on one tire at a time, with its broad range and complete control it is one of the most versatile deflators on the market. (Several companies now sell similar style units.) Automatic deflators are just what you’d think: Screw one on a valve, and it automatically depresses the valve tip and deflates the tire to a preset pressure. While generally slower than the ARB E-Z, if you have four going at once it’s the fastest way to air down a vehicle—and you can be chatting and drinking coffee while waiting. From left to right: Staun, Trailhead, and CB Developments deflators. The best automatic deflators I’ve used are the superb (if wordy) CB Developments Mil-Spec Multi-Choice Deflators, which come in two ranges (10-20 psi and, for rock crawlers, 2-12 psi). Each allows you to choose from multiple settings within the range, with no calibration necessary, and they have proven to be extremely accurate. However, even the upper range is on the low side for many vehicles, and, more importantly, they retail for around $100 each, so a full set of four would represent a frightening chunk of cash. Much less frightening to the pocketbook, and still excellent, are the compact, solid-brass Staun II deflators, born in Australia but now American-made by Coyote Enterprises, and just $80 for a set of four. The Stauns require some preliminary calibrating, but once they’re set they are accurate and very quick, although restricted to a single target pressure unless re-calibrated. (You can estimate a new setting by loosening the lock ring and turning the cap; one turn equals about three psi.) Also around $80 per set are the Trailhead deflators. They work well, but I found them fussy to calibrate, and they won’t initiate unless the existing tire pressure is around twice the target pressure. The Stauns have a manual start ring that allows initiation with as little as three psi difference. 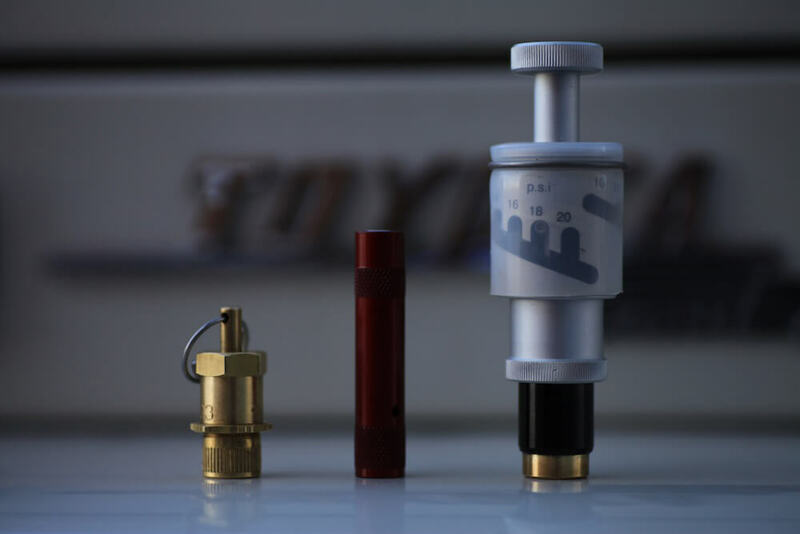 An alternative are the Monster Valves from Powertank ($172 per set), which can be used both for (extremely fast) airing down, and re-inflating as well. However, the Monster Valve requires drilling a second hole in your wheel—only you can decide if you’re committed enough to go that route. 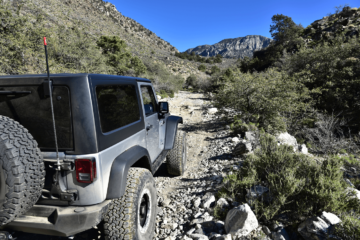 So, you’ve aired down your tires and impressed yourself and your buddies with the difference in performance and comfort driving on rough trails. As you head back to paved roads, you’ll want to inflate your tires back up to road-worthy pressures for safety and efficiency. When it’s time to air up, you have a couple of choices of how to do so. One choice is a CO2 tank, which looks just like a scuba tank but holds pressurized carbon dioxide. Why? Because the same size tank can hold a far larger volume of CO2 than it can of compressed air, and at lower pressure. CO2 tanks are very fast at refilling tires, and produce enough pressure to run air tools. They’re portable and require no wiring. Refilling CO2 is inexpensive, and a ten-pound tank will air up about 40 33×12.5 tires from 10 to 20 psi. However, the capacity is clearly finite—and of more concern is the fact that CO2 can leak out of tires over time. Despite the fact that a CO2 molecule is larger than a nitrogen or oxygen molecule (the main components of air), CO2 is actually soluble in butyl rubber—it can essentially melt right through the tire, at a greater or lesser rate depending on the specific carcass compound. If you use CO2, be sure to monitor your tire pressure. Air Compressors If you prefer an endless supply of good old air, you’ll want a compressor. We’ve already determined that you’ll skip the enraged-Chihuahua model, right? So how do you ensure you get a high-quality compressor? Basically (you knew this was coming), you get what you pay for. First, ignore compressors that plug into the cigarette lighter—they simply cannot draw enough amperage to be effective. Likewise, ignore that “150 psi!” rating—virtually any pump will produce more than enough theoretical pressure for automotive use. It’s the cfm (cubic feet per minute) rating and duty cycle you need to evaluate. The cfm is self-explanatory. Duty cycle refers to how long the unit can run before it needs to shut down and cool off. A 50-percent duty cycle means the pump can run for 30 minutes out of an hour. It’s easy to see the relationship: A high cfm rating means little if the duty cycle is poor, and a 100-percent duty cycle means little if the cfm rating is below standard. Furthermore, some compressors display an impressive cfm rating at zero psi, but fall off significantly with higher pressures. Look for factory specs that list both. Just how much do you air down? 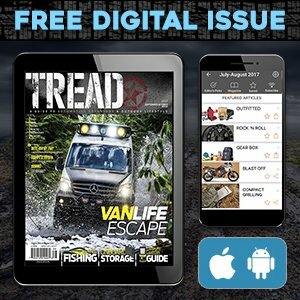 Obviously, it depends on conditions, but also on the normal street pressure you run, which might be 35 psi in a Tacoma, or 65 in a 9,000-pound Sportsmobile on big E-rated tires. 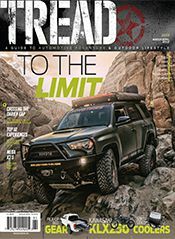 As a (very) rough guide, dropping pressure about 25 percent will significantly increase traction and comfort on rough dirt roads, washboards, and moderate trails. Dropping 30 to 35 percent elongates the tire’s footprint enough to enhance grip on slickrock, and allows it to deform around and cling to big rocks. Heading down to 50 percent, even a bit less, will nearly double the length of the contact patch to float over very soft sand. 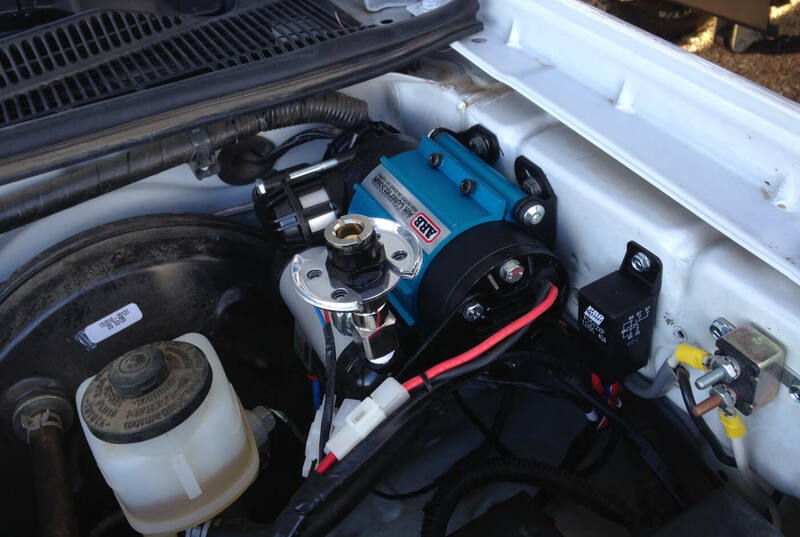 A built-in, hardwired compressor with a remote switch and a hose connector in the bumper or some other accessible spot is the ultimate in convenience. However, it’s only convenient for one vehicle. If you have more than one, or want to have the compressor available for traveling with others, you’ll want a portable with a case and battery clips. I’ve had very good luck with compressors from ARB, Extreme Outback, and Viair. ARB’s High Output single compressor works well as a built-in unit for operating the company’s air locker, as well as for filling tires. The ARB Twin is essentially two High Output compressors synched as one. It’s wickedly fast—4.68 cfm at 29 psi, 100-percent duty cycle—and built to military specs with all-ball-bearing motors and hard-anodized cylinder bores. for inflating tires as well. The portable version is definitively the best of its kind I’ve tested; inside a waterproof case it incorporates an air tank to facilitate using air-driven tools. The Twin is an investment, to be sure, but one that will fully justify its price. Viair offers a bewildering selection of stand-alone compressors and on-board air systems. The Constant Duty kit boasts a 100-percent duty cycle, an air tank, and every piece of wiring, hose, and connector you need to install it permanently. Extreme Outback’s premier compressor is the ExtremeAir Magnum (enough with the “extremes” already! ), which puts out an astonishing 2.6 cfm at 100 psi (and draws a substantial 82 amps). There’s an ExtremeAir Junior if you don’t need such massive output. 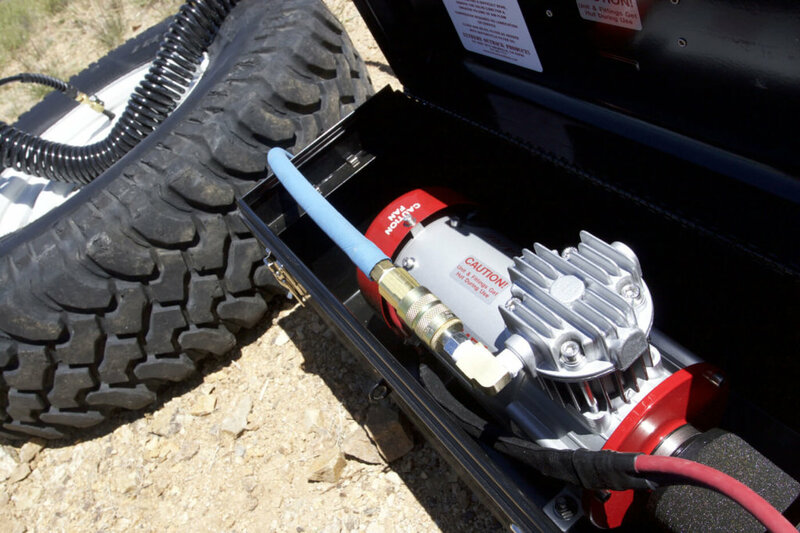 Extreme Outback’s powerful ExtremeAir Magnum compressor. There’s an advantage to a good compressor we haven’t even touched on: Carry a plug kit as well and you’ll be able to repair most simple tire punctures without even having to remove the wheel, much less bother with the spare. Whether you’re cutting across the Lybian Desert on a grand expedition or taking a short cut to your favorite fishing hole, the performance advantage of airing down tires before heading off road cannot be stressed enough. If you think you’re stuck with a bad ride, slipping traction, or even on a rock, try airing down your tires. Even if you think your tires aren’t right for the surface you’re on, reducing your tire’s air pressure can really work wonders. 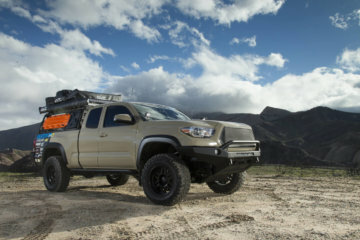 With a high-quality compressor and a set of deflators, you’ll save your vehicle and the trail, and be able to tackle terrain that would have brought you to a halt otherwise—and do it with style. Even if you never have to face a sea of sand. 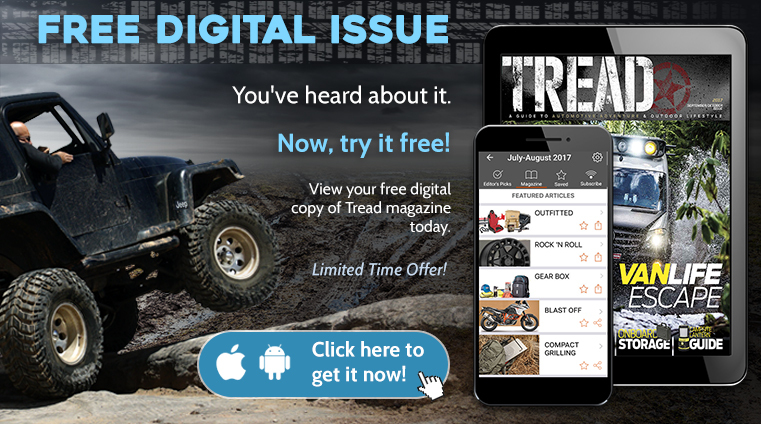 Editor’s note: A version of this article first appeared in the March-April print issue of Tread Magazine.